Oracle Park is a baseball park in San Francisco, California. It is the home field of the Major League Baseball team called the San Francisco Giants. It replaced Candlestick Park as the home of the Giants. It was originally called Pacific Bell Park, and later as SBC Park and AT&T Park. The most recent name change came in 2019, when locally based technology giant Oracle Corporation signed a naming deal with the Giants. ↑ Schulman, Henry (January 9, 2019). "SF Giants' home now called Oracle Park after AT&T split". San Francisco Chronicle. Retrieved January 15, 2019. 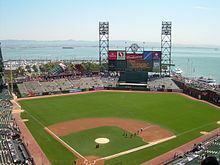 Wikimedia Commons has media related to AT&T Park. This page was last changed on 17 February 2019, at 06:43.